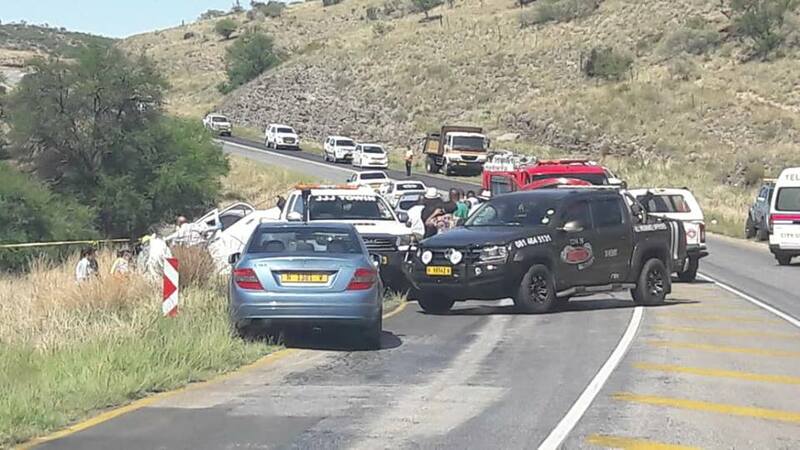 Pictured: Members of the Windhoek Emergency Services assisting the surviving victims of a motor vehicle accident that claimed the lives of two South African visitors to Namibia on the road to the Hosea Kutako International Airport. A head-on collision between an airport shuttle and another vehicle claimed the lives of two South African visitors to Namibia on their way to the Hosea Kutako International Airport. According to Deputy Commissioner Edwin Kanguatjivi, commander of the Namibian Police’s Public Relations Division the tragic incident occurred at about 10:00 on Wednesday morning about six kilometres outside of Windhoek when the 21-year-old driver of a BMW driving in the opposite direction overtook another vehicle on a blind spot and crashed head-on into the airport shuttle. 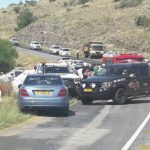 He indicated that charges of culpable homicide, reckless and negligent driving as well as a charge of inconsiderate driving against the person driving the BMW will be investigated by the police.